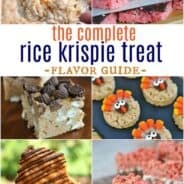 Of all the delicious food I enjoy to make, Rice Krispie treats are one of my favorite snacks. So, when I saw these on this blog, I knew I had to make them. They turned out so cute. You need to make sure you slice your peep in half (so you have a front and a back), otherwise they are very thick! 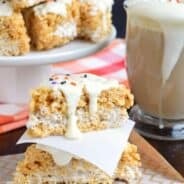 I made homemade krispie treats, I know I should have made my Avalanche Krispie Bars, they would have been so yummy with the chocolate coating and peeps. I’ve seen others make these using individually wrapped Rice Krispie treats. That would work, I just do not like the taste of those. 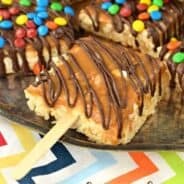 These are super easy and would have made a great treat to send to the bake sale, unfortunately we ate them. All of them. I made a second batch of Rice Krispie treats that I pressed into my muffin pans (no liners). I then drizzled white chocolate (after melting it) over the top of the nests. Attached my peep and a couple Hershey chocolate eggs (my favorite). These were really tasty! I made a batch of Krispie treats in a 13x9 pan, flipped it onto a cutting board when they had cooled and hardened slightly. I melted several colors of Wilton candy melts and spread them on the top side of the treats. Dipping the stick into melted vanilla bark, I just shoved that up the bottom (wow, that sounds appetizing). Attach the peep and sprinkles while the chocolate is still soft. What a cute little idea for using Peeps.